Prince Dimitri Romanovich returned after nearly three years of absence to Ekaterinburg, this time on a humanitarian mission as chairman of the Romanov Fund for Russia. 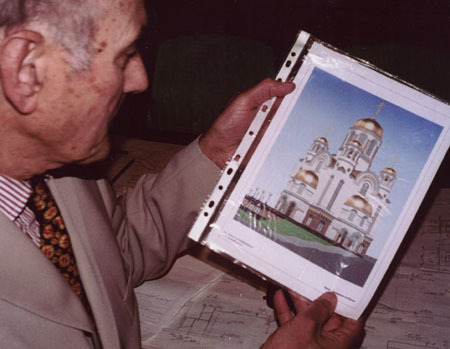 "On 3 June 2001 my humanitarian activity in Russia on behalf of the Romanov Fund for Russia brought me to Ekaterinburg, where I was to present 80 hearing aid instruments to selected children and 10 to war veterans. I had arrived from the Eastern Siberian town of Irkutsk, where I had taken part in similar humanitarian activities and where I had enjoyed a very warm welcome from Vadim, Metropolitan of Irkutsk and Angarsk, representatives of the local authorities and several rehabilitation centres. 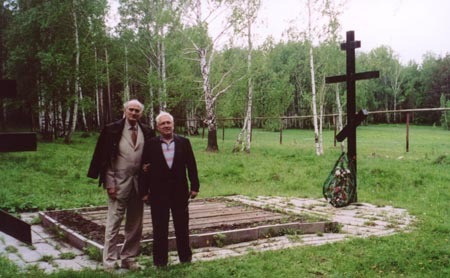 Returning to Ekaterinburg after three years I felt deep apprehension as I was afraid of being asked once more to visit the sites connected to the massacre of the Imperial Family, of Dr Botkin and the faithful retainers. I feared once more to be confronted with half-forgotten and unkept sites that had left me with deep and painful memories. The day before the official ceremony of the handing of the donations I was invited to meet Vikentij, Metropolitan of Ekaterinburg and Verhotursk, who met me in front of the Trinity Church and asked me to take part in a two-hour service, the day being that of Trinity Sunday. After the termination of the religious service I was invited to have lunch with the Metropolitan at his residence after which he proposed to drive with him to the abandoned shaft outside Ekaterinburg into which all the victims of the massacre had been thrown on 17 July 1918. During my visit to Ekaterinburg three years earlier, I was told that the site known as Ganin’s pit (Ganinaja Jama) located in the Four Brother’s Woods, could not be visited as there was no road of access and that the whole area was marshy and densly wooded. Just before reaching our destination I was astonished that there was now a rough road in the woods and at a distance I could see people working and transporting logs and construction material. Few minutes later I found myself in front of a just completed church with bell tower, entirely made of very large logs. The people I had seen at distance were young monks working hard on other constructions. At the approach of our car, they rapidly gathered to meet and be blessed by the Metropolitan, and, to their astonishment, to also meet a member of the Imperial Romanov Family. Bells rang, prayers were sung in powerful, young voices, all of us feeling deeply emotional. I was shown the pit located just a few meters from the church, a large cross and a bronze plaque located in front. I was told that the road will be asphalted, seven monasteries will be built and the whole area would be enclosed by a fence creating a secluded site for monastic life and prayer. A truly unforgettable and uplifting visit to a tragic site. Two days later, accompanied by A.N. Avdonin, the person who years ago had identified the site and discovered the remains of the martyrs, I visited the two locations that had left me with such deeply unpleasant emotions: the Old Koptiaky road where the remains were found and the empty lot where once the Ipatiev residence stood. Three years ago the Koptiaki road site was accessible with some difficulty as one had to cross a wooded area through a watery, unequal path at the end of which one found in a clearing a large cavity in the earth filled with water. I was very pleased to find that the entrance to the Koptiaky road was now marked by a wooden portal at the top of which a large inscription saying:"Memorial of the Romanovs". The path was now straighter and wider and at the end one could glimpse a wide clearing. In the middle was a large cross standing next to a cement-tiled area in the middle of which was a rectangular area covered by half a dozen railroad crossties. The next visit was to the former Ipatiev House place which three years ago looked as an empty parking lot with a lonely metal cross in the middle of it. A big surprise awaited me. The site was encircled by a high fence and one could see a crane lifting some heavy construction material. I was met by a young engineer who took me around to what looked as any building complex in its first stages of construction with timber, cement mixers, water and mud everywhere. 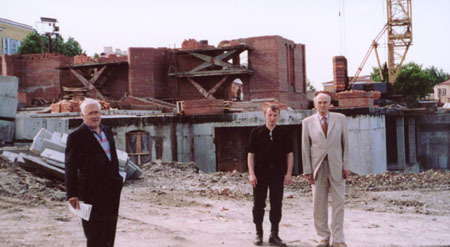 Due to a bulldozer creeping noisily behind us I could hardly hear the young man explaing the programme of construction which had only started six months earlier. When it finally passed me at a distance of only a few uncomfortable centimeters, I heard my guide saying that now we were going to enter into the center of the construction and descend to the exact spot where the celler of the Ipatiev house used to be. In the semi-darkness I could discern first an empty space and to my right some steps leading to a slightly eleveted area. The young man told me that it was there that the subterranean, or "lower" church, iconostasis and sanctuary would be located, on the precise spot where the massacre had taken place. Right over it, the"upper" church would be placed where most religious services would be celebrated. Returning to ground surface I was asked to come to the mobile home of the architect who wanted to show me plans, illustrations and in general explain the building schedule and timetable. I was told that in about two years’ time they expected that the church could be innaugurated, unless availability of funds was courtailed. 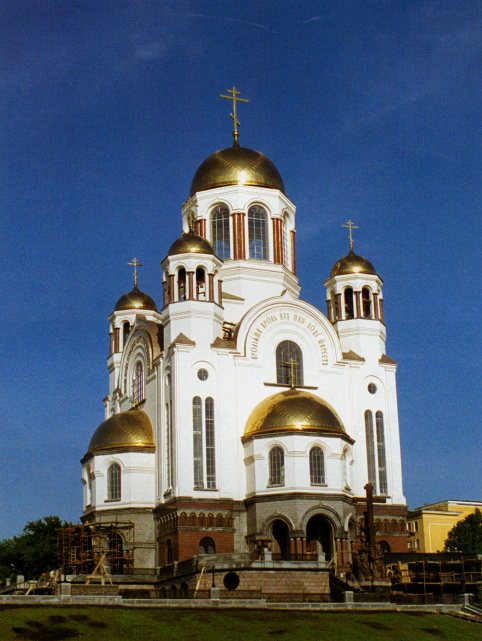 To conclude I would like to mention that the tenuous religious and historical feelings towards the slain Tsar and his family that I had experienced three years earlier in Ekaterinburg had now developed into a strong, respectful Christian attitude of penitence, prayer and hope." Rungsted Kyst, Denmark, June 2001.